This weekend we went to visit a friend and her family in Minsk, Belarus, and as we had left booking a bit late and prices were pretty high on the airline Belavia which flies directly from Berlin, we booked tickets with Lufthansa which flew via Frankfurt and Vilnius, then took a train from Vilnius to Minsk. The flight arrived late at night to Vilnius, but it was cheap and easy to book a taxi to take us from the airport to our B&B. The B&B was run by a lovely Lithuanian woman who stocks her kitchen with cookies and tea, so even though we arrived really late, we could at least have a little something to eat and drink before going to bed. One major difference we found soon after arriving is that in Lithuania, you can’t throw toilet paper into the toilets as somehow this blocks up the plumbing. So if you go there, be sure to use the wastepaper baskets provided, as there are not always signs to explain this as there were in the guesthouse. This was only the second country I’d seen this in, the first was Turkey. We later found it was the same in Belarus. Sometimes in Lithuania the public bathrooms were therefore a bit smelly, but in Belarus they were very clean, so the system seems to work fine if the bins are emptied frequently. In the beginning it felt strange but it is not as bad as it sounds. In the morning we met the landlady, who was making pancakes for everyone, which she served with a really good local cottage cheese and some jams. 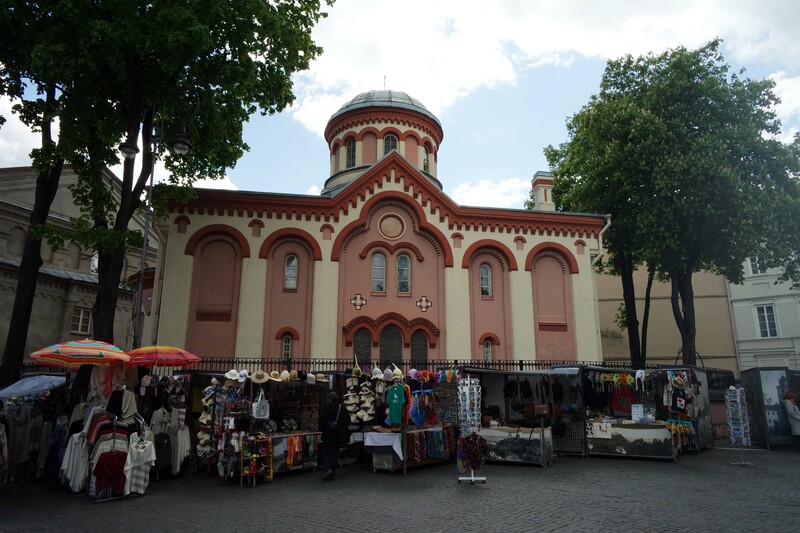 When asked what her recommendations were, she mentioned the many churches in Vilnius, saying that some were nice on the outside, some on the inside, and some both inside and outside. When she was at university she used to sit in the different churches and study, as it was nice and quiet. She said that since the churches have big walls, they are also often used to display art. We only had a few hours, so could not visit all the places we would have liked to, but went for a walk just to look around. We saw the town hall and square, and the outside of quite a few churches. Despite having a bit of church fatigue from seeing many many churches in Europe, I regret not going into the St Peter and St Paul church as apparently there are many statues inside, but we just didn’t have time. I would like to go back to Vilnius again and also see places such as the amber museum, the botanical garden and Europos park. There is a tourist info centre in the town square which has maps and provides helpful information. Trolley buses seem to be the main means of public transport and are all over the place and not expensive. We enjoyed walking around looking at the different streets, squares, buildings, artworks and souvenir stalls. While looking for a WC, we also found an indoor market selling all kinds of delicious smelling foods (cheeses, sausages, smoked meats, vegetables, etc), clothes, shoes and more. We walked to an artist’s neighbourhood called the Užupio Republic , which even has its own constitution and president. The principles of the constitution can be found written in many different languages on a series of plaques fixed to a wall in Užupio. Actually I think would be a good idea to display the constitution of all countries publicly like this, so that you can be reminded of it and think about it. One of my favourite tenets of the constitution of Užupio is number 10: “Everyone has the right to love and take care of the cat”. We would both love to have a cat but can’t as we live in an apartment, work all day, and the owner of the apartment is allergic to cats anyway, and hates the idea of them scratching his furniture. Another principle I like is number 2: “Everyone has the right to hot water, heating in winter, and a tiled roof.” I guess any kind of roof would do, but it’s the idea that everyone has the right to be comfortable and not cold in winter that I like, since although many people take these things for granted, there are some people for whom this would make a huge amount of difference. Užupio means “the other side of the river” in Lithuanian, the river being the Vilnia river, after which Vilnius is named. The river Vilnia is very beautiful and natural seeming, like the kind of river you’d see in a forest and not a city. As Užupio is an artists neighbourhood (or republic!) there are numerous interesting statues to be seen there. Užupio is quite hilly, and we also ended up walking through an unexpected but beautiful patch of forest in the middle of the city. 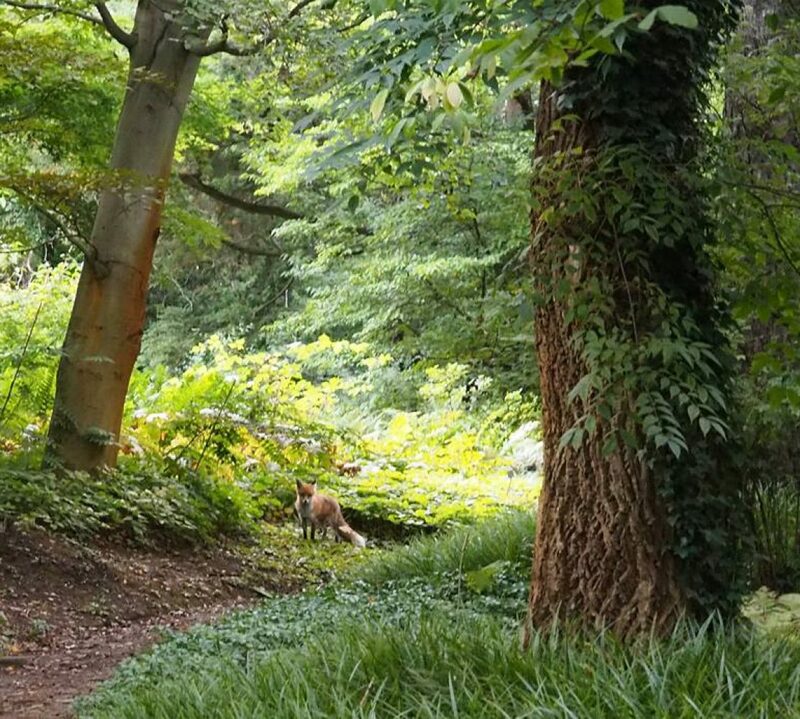 When you look at a map of Vilnius it seems that there are a lot of green areas all around, and it would be great to come back for a longer holiday in Lithuania to explore the countryside, and also visit the Baltic coast. We ran around sightseeing before heading to the train station to go on to Minsk, so didn’t try the local food in Vilnius until returning on way back from Minsk a few days later. In both Lithuania and Belarus they eat a lot of pancakes – thick ones, sometimes of flour and sometimes made of potato – with sour cream and jam or other toppings like smoked salmon or (in Belarus) caviar. 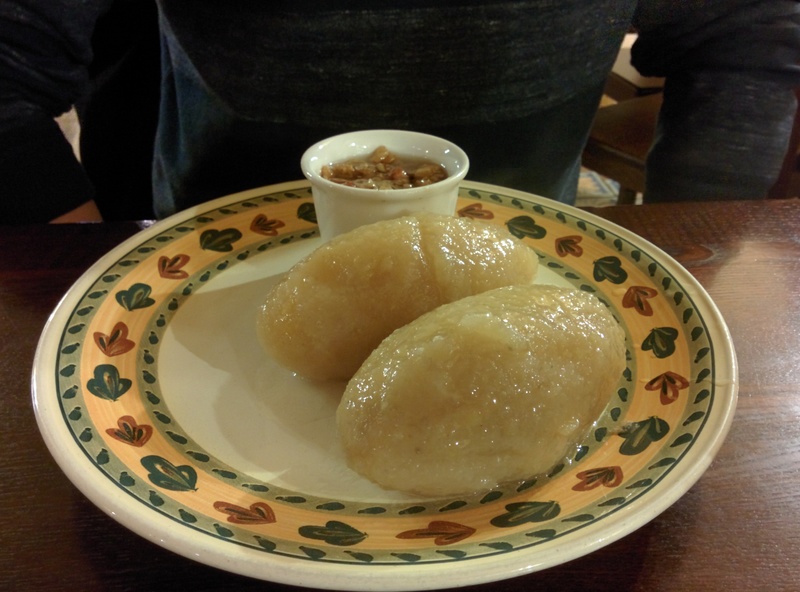 We also found potato dumplings on the menu in Vilnius in many variations and tried these. 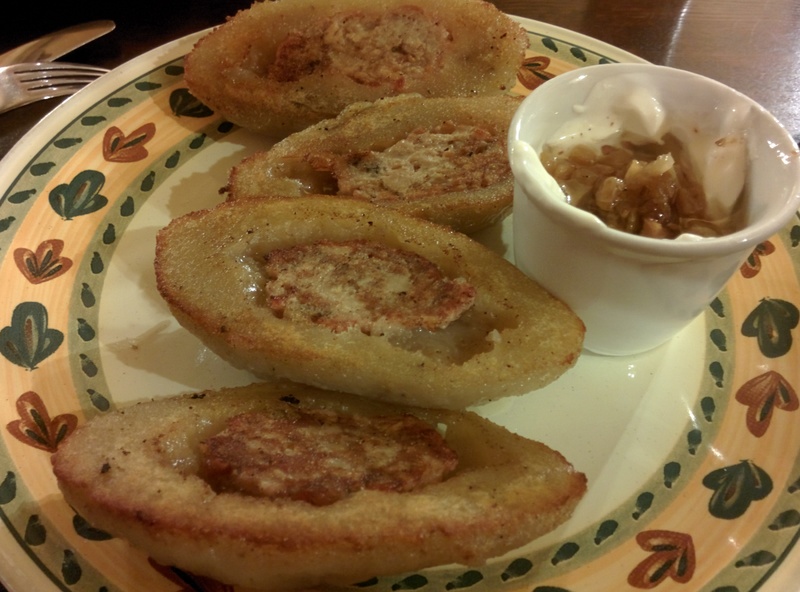 Mine were fried and served with a sour cream and pork crackling sauce, very filling but delicious. J had the boiled ones and said they were equally filling. After a few days of eating the pancakes in both countries for breakfast, lunch and supper I think I’ll miss them in Berlin and will have to try to make some here. That’s about all we saw of Vilnius, but more on Minsk soon!